Interstate 40 (I-40) is a major east-west Interstate Highway running through the south-central portion of the United States generally north of I-10, I-20 and I-30 but south of I-70. The western end is at I-15 in Barstow, California; its eastern end is at a concurrency of U.S. Route 117 (US 117) and North Carolina Highway 132 in Wilmington, North Carolina. It is the third-longest Interstate Highway in the United States, behind I-80 and I-90. Much of the western part of I-40, from Oklahoma City to Barstow parallels or overlays the historic US 66, east of Oklahoma City the route generally parallels US 64 and US 70. I-40 runs through many major cities including Albuquerque, New Mexico; Amarillo, Texas; Oklahoma City, Oklahoma; Little Rock, Arkansas; Memphis, Tennessee; Nashville, Tennessee; Knoxville, Tennessee; Greensboro, North Carolina; and Raleigh, North Carolina. Even though I-40 is a cross-country east-west interstate, it does not nearly touch both oceans or coasts like I-10, I-80 and I-90 does. The eastern terminus touches near the Atlantic Ocean, but the western terminus doesn't touch the Pacific Ocean. A sign showing the distance to Wilmington, North Carolina at the start of Interstate 40 in Barstow. This sign has been stolen several times. Interstate 40 is a major east–west route of the Interstate Highway System. Its western end is in Barstow, California. Known as the Needles Freeway, it heads east from Barstow across the Mojave Desert in San Bernardino County to Needles, before it crosses into Arizona southwest of Kingman. I-40 covers 155 miles (249 km) in California. A sign in California showing the distance to Wilmington, North Carolina has been stolen several times. Interstate 40 is a main route to the South Rim of the Grand Canyon, with the exits leading into Grand Canyon National Park in Williams and Flagstaff. I-40 covers 359 mi (577.75 km) in Arizona. Just west of exit 190, west of Flagstaff, is its highest elevation along I-40 in the U.S., as the road crosses just over 7,320 ft (2,231.14 m). I-40 also passes through the Navajo Nation, the largest Indian reservation in the U.S.
I-40 covers 374 miles (602 km) in New Mexico. Notable cities along I-40 include Gallup, Grants, Albuquerque, Santa Rosa, and Tucumcari. I-40 also travels through several different Indian reservations in the western half of the state. It reaches its highest point of 7,275 feet at the Continental Divide in western New Mexico between Gallup and Grants. Arizona, New Mexico, and Texas are the only three states where I-40 has a speed limit of 75 mph (120 km/h) instead of 70 mph (112 km/h) which happens in California, Oklahoma, Arkansas, Tennessee, and North Carolina. An at-grade intersection on I-40 in Texas. Photo taken in 2003. In the west Texas panhandle area, there are several ranch roads connected directly to the interstate. One of the marked at-grade crossings is shown to the right. The only major city in Texas that is directly served by I-40 is Amarillo, which connects with Interstate 27 that runs south toward Lubbock. I-40 has only one welcome center in the state that is located in Amarillo at the exit for Rick Husband Amarillo International Airport, serving both sides of the interstate. Interstate 40 goes through the heart of the state, passing through many Oklahoma cities and towns, including Erick, Sayre, Elk City, Clinton, Weatherford, El Reno, Yukon, Oklahoma City, Del City, Midwest City, Shawnee, Okemah, Henryetta, Checotah, Sallisaw, and Roland. I-40 covers 331 miles (533 km) in Oklahoma. In Downtown Oklahoma City, Interstate 40 was rerouted a mile south of its former alignment and a 10–lane (5 in each direction) facility replaced the former I-40 Crosstown Bridge; itself will be replaced with an urban boulevard currently designated as Oklahoma City Boulevard. I-30/US 65/US 67/US 167 branch south from I-40/US 65/AR 107 in North Little Rock. This is also the eastern terminus of I-30. Interstate 40 enters the west-central part of the state and runs for 284 miles (457 km) in Arkansas. The route passes through Van Buren, where it intersects the southbound Interstate 540/US 71 to Fort Smith. The route continues east to Alma to intersect Interstate 49 north to Fayetteville, Arkansas. Running through the Ozark Mountains, I-40 serves Ozark, Clarksville, Russellville, Morrilton and Conway. 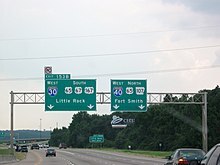 The route turns south after Conway and enters North Little Rock, which brings high volume interchanges with Interstate 430, I-30/US 65/US 67/US 167, and I-440/AR 440. The interstate continues east through Lonoke, Brinkley, and West Memphis on the eastern side. Interstate 40 briefly overlaps Interstate 55 in West Memphis before it crosses the Mississippi River on the Hernando de Soto Bridge and enters Memphis, Tennessee. More of Interstate 40 passes through Tennessee, 455 miles (732 km), than any other state. The interstate goes through all of the three Grand Divisions of Tennessee and its three largest cities, Memphis, Nashville and Knoxville. Jackson, Lebanon, Cookeville, Crossville, and Newport are other notable cities and/or towns through which I-40 passes. Before leaving the state, I-40 enters the Great Smoky Mountains towards North Carolina. The section of Interstate 40 which runs between Memphis and Nashville is often referred to as the Music Highway. During reconstruction, a long section of I-40 through downtown Knoxville near the central Malfunction Junction was completely closed to traffic from May 1, 2008 and not reopened until June 12, 2009 with all traffic redirected via Interstate 640, the northern bypass route. The redesigned section now has additional lanes in each direction, is less congested, and has fewer accidents. In North Carolina, I-40 travels 421 miles (678 km). It enters the state as a winding mountain freeway through the Great Smoky Mountains which frequently closes due to landslides and weather conditions. It enters the state on a mostly north-south alignment, turning to a more east-west alignment upon merging with U.S. Route 74 at the eastern terminus of the Great Smoky Mountains Expressway. From there the highway passes through Asheville, Hickory, and Statesville before reaching the Piedmont Triad. Just east of the Triad city of Greensboro, North Carolina it merges with I-85 and the two roads split again just west of the Research Triangle area, passing through Durham and Raleigh. From the Triangle to its eastern terminus in Wilmington, it once again takes a more north-south alignment. A standard distance sign exists near the start of the westbound section of I-40 in Wilmington that indicates the distance to Barstow, California as 2,554 miles (4,110 km). Although NCDOT has stated it would not be replaced after frequent thefts, as of August 15, 2013, the sign is present. For about 1,000 miles (1,600 km), I-40 follows the general route of Beale's Wagon Road from Arkansas to California. Beale's Wagon Road was built in 1857–59 by a team led by Lt. Edward Fitzgerald Beale using a team of camels as pack animals. In Albuquerque, New Mexico, I-40 was originally meant to replace Central Avenue through the center of the city. However, due to development and public opposition, a route running to the north of that one was chosen. The freeway intersects Central Ave. at both ends of the city. In 1957, the California Department of Highways proposed that the route be renumbered to Interstate 30 instead, because of the already existing U.S. Route 40 in the state. Then, U.S. Route 40 was decommissioned in California in 1964, as a part of a major revamping of California's overall highway numbering system, so the problem disappeared. The California State government submitted State Route 58 between Barstow and Bakersfield for I-40 extension potential in 1956 and 1968, though those requests were rejected. This portion of SR 58 was once signed as the U.S. Route 466. From 1963 to 1966, the U.S. government considered a plan, part of Project Plowshare, to use atomic bombs to excavate a path for I-40 through California. The project was scuttled largely due to the cost of developing the explosives and due to the unavailability of a "clean bomb". In Memphis, I-40 was originally intended to go through the city's Overton Park toward downtown. Several miles of interstate were actually built within the I-240 loop. That portion of highway still exists, and it is in regular use as the non-Interstate Sam Cooper Boulevard, reaching the eastern end of the Chickasaw Country Club. Environmentalist opposition, combined with a victory in the United States Supreme Court by opponents of the Overton Park route (see Citizens to Preserve Overton Park v. Volpe) forced abandonment of the original plans, and the road never reached the park. For over 20 years, I-40 signs existed on the dead-end route toward Overton Park. Eventually, the northern span of the I-240 loop was redesignated as I-40. In 1971, the North Carolina State Highway Commission approved a plan to extend I-40 from Research Triangle Park to Interstate 95, a distance of 41 miles, at a cost of $75 million. Most of the highway would be four lanes, though six lanes were likely near Raleigh, where I-40 would extend the Beltline. Several routes were being considered, but at the time, the most likely route would have ended north of Smithfield. Originally, I-40 was constructed through downtown Winston-Salem, and it continued to follow that route until a new urban bypass route was built. After the bypass was completed around 1992, I-40 was relocated to the new freeway. The old highway was then redesignated as Interstate 40 Business, creating a business route that is actually an expressway for its entire length, a rarity among business routes. There are arguments that the former I-40 expressway in Winston-Salem should become an interstate again, especially since the road is currently undergoing an upgrade. There is one even loop number left for I-40, Interstate 640. Interstate 840 was recently available, however, since the NCDOT has had plans to use it for the northern loop of a beltway that is being built around nearby Greensboro. The I-40 bridge disaster occurred on May 26, 2002 when a barge collided with a bridge foundation member near Webbers Falls, Oklahoma, causing a 580-foot (177 m) section of the I-40 bridge to plunge into the Arkansas River. Automobiles and semi-trailers fell into the water, killing fourteen people. The "Big I" I-25 and I-40 interchange in Albuquerque, New Mexico, was given an honorable mention by the United States Department of Transportation and the Federal Highway Administration for excellence in urban highway design in 2002. Landslides are common in the Pigeon River Gorge section along the Tennessee and North Carolina border. Here the roadway was cut into the slopes of several steep mountains. Accidents on the winding road are also common especially during bad weather. On October 25, 2009, Interstate 40 was closed at the North Carolina and Tennessee border due to a landslide at Mile Marker 2.6 just east of the Tennessee state line. All Traffic was detoured via Interstates 26 and 81, and non-heavy load traffic via US 25/70. The roadway was reopened on April 25, 2010, with some remaining limitations on westbound traffic. The state of California submitted the segment of what is now State Route 58 (SR 58) between Barstow and Bakersfield for chargeable Interstate approval twice, in 1956 and 1968, presumably as an extension of I-40, but it was rejected both times. This segment of SR 58 is being upgraded to freeway standards piece-by-piece as Caltrans has funds available. An extension of I-40 in California from its present terminus at Barstow to Bakersfield, and possibly as far west as Paso Robles, has been proposed. The proposed I-40 extension would generally follow SR 58 to Bakersfield, and follow SR 46 to Paso Robles. However, there is no current push to apply for Interstate designation. SR 46 is slowly being upgraded to Interstate standards, minus overpasses, from US 101 in Paso Robles to I-5 in Lost Hills. US 95 west-northwest of Needles. The highways travel concurrently to Needles. Future I‑11 / US 93 in Kingman. The highways travel concurrently to east-northeast of Kingman. US 89 / US 180 in Flagstaff. I-40/US 180 travels concurrently to Holbrook. US 191 in Chambers. The highways travel concurrently to Sanders. US 84 west-northwest of Santa Rosa. The highways travel concurrently to Santa Rosa. US 54 in Santa Rosa. The highways travel concurrently to Tucumcari. I‑27 / US 60 / US 87 / US 287 in Amarillo. I-40/US 287 travels concurrently through Amarillo. US 270 west of El Reno. The highways travel concurrently to northwest of Shawnee. I‑35 / I‑235 / US 62 / US 77 in Oklahoma City. I-35/I-40/US 62 travels concurrently through Oklahoma City. US 62 in Okemah. The highways travel concurrently to Henryetta. US 75 northeast of Clearview. The highways travel concurrently to Henryetta. I‑540 / US 71 in Van Buren. I-40/US 71 travels concurrently to Alma. US 65 in Conway. The highways travel concurrently to North Little Rock. I‑30 / Future I‑57 / US 65 / US 67 / US 167 in North Little Rock. I-40/US 67/US 167 travels concurrently through North Little Rock. US 63 in Hazen. The highways travel concurrently to West Memphis. US 79 south of Jennette. The highways travel concurrently to West Memphis. I‑55 / US 61 / US 63 / US 64 in West Memphis. I-40/I-55/US 61/US 64 travels concurrently through West Memphis. I‑69 / I‑240 in Memphis. I-40/I-69 travels concurrently through Memphis. US 412 in Jackson. The highways travel concurrently to northeast of Jackson. I‑65 in Nashville. The highways travel concurrently through Nashville. I‑75 west of Farragut. The highways travel concurrently to Knoxville. I‑640 / US 25W in Knoxville. I-40/US 25W travels concurrently through Knoxville. US 74 north-northwest of Clyde. The highways travel concurrently to Asheville. US 70 in Black Mountain. The highways travel concurrently to southwest of Old Fort. US 52 / US 311 in Winston-Salem. I-40/US 311 travels concurrently through Winston-Salem. US 421 west of Greensboro. The highways travel concurrently to Greensboro. US 220 in Greensboro. The highways travel concurrently through Greensboro. US 29 / US 70 in Greensboro. The highways travel concurrently through Greensboro. I‑85 in Greensboro. The highways travel concurrently to southwest of Hillsborough. I‑440 / US 1 / US 64 in Raleigh. I-40/US 64 travels concurrently through Raleigh. US 70 in Garner. The highways travel concurrently to west-southwest of Clayton. Future I‑42 / US 70 near Clayton. In Oklahoma City, the designation I-440 had been given to a stretch of Interstate Highway from I-240 to US 66. It was a part of Grand Boulevard that had been built in compliance with Interstate Highway standards. In 1982, as part of Oklahoma's "Diamond Jubilee", I-44's western terminus was moved from the I-35/I-44 junction to the Texas–Oklahoma state line via the Belle Isle Freeway (connecting I-440 with I-35); I-440, the H. E. Bailey Turnpike; and the turnpike connector road on the eastern edge of Lawton, Oklahoma. The I-440 number was dropped at the time. ^ Official Route Numbering for the National System of Interstate and Defense Highways (Map). American Association of State Highway Officials. August 14, 1957. Retrieved March 27, 2017. ^ a b Adderly, Kevin (January 27, 2016). "Table 1: Main Routes of the Dwight D. Eisenhower National System of Interstate and Defense Highways as of December 31, 2015". Federal Highway Administration. Retrieved February 8, 2017. ^ "I-40 Barstow, Calif., sign gone for good". StarNewsOnline.com. November 12, 2009. Retrieved September 19, 2011. ^ Planning and Research Division (2011). General Highway Map, Crawford County, Arkansas (PDF) (Map). 1:62,500. Little Rock: Arkansas State Highway and Transportation Department. Retrieved November 15, 2011. ^ Planning and Research Division (2009). General Highway Map, Pulaski County, Arkansas (PDF) (Map). 1:62,500. Little Rock: Arkansas State Highway and Transportation Department. Retrieved November 15, 2011. ^ Planning and Research Division (2009). General Highway Map, Crittenden County, Arkansas (PDF) (Map). 1:62,500. Little Rock: Arkansas State Highway and Transportation Department. Retrieved November 15, 2011. ^ Tennessee Department of Transportation. "SmartFix: I-40/James White Parkway/Hall of Fame Drive". Tennessee Department of Transportation. Archived from the original on December 31, 2010. ^ Tennessee Department of Transportation. "SmartFix: I-40/James White Parkway/Hall of Fame Drive". Tennessee Department of Transportation. Archived from the original on April 29, 2009. ^ Wilshire, Howard (Spring 2001). "Building a Radioactive Highway" (PDF). Desert Report. Sierra Club. pp. 9, 14. Archived from the original (PDF) on March 26, 2009. ^ "SHC Approves I-40 Link in Wake County". Concord Tribune. Associated Press. July 20, 1971. ^ Wilson, Amy (January 18, 2002). "U.S. Route 66: Historic Road Is Time Line of America". National Geographic News. Retrieved February 18, 2006. ^ "Excellence in Highway Design - 2002 I-25/I-40 System-to-System Interchange, Albuquerque, New Mexico". Federal Highway Administration. Retrieved November 27, 2011. ^ "HWY 25-70 a scenic, tough rock slide detour". Volunteertv.com. Retrieved November 27, 2011. ^ Hickman, Hayes (April 26, 2010). "Section of I-40 closed since Oct. rockslide reopens". Knoxville News Sentinel. Retrieved April 26, 2010. Wikimedia Commons has media related to Interstate 40. This page was last edited on 18 April 2019, at 20:39 (UTC).